TWENTY-NINTH DAY. --PERSEVERANCE IN PRAYERS FOR THE DEPARTED. Holy Church, our good and tender mother, most ardently desires that her children be admitted to the beatific vision of God, and incessantly offers pious supplications, during the Holy Sacrifice of the Mass and the Divine office, to obtain mercy for the holy suffering souls, thereby teaching us to think of them frequently; for to the end of time there shall be souls in the flames of Purgatory in need of assistance and fervent prayers, which we should never fail to offer in their behalf. The ways of God are often inscrutable, and his designs concerning the holy souls are unknown to us, hence there may be among their number some, who have a just claim on our assistance, although a long time may have passed away since the close of their earthly career. Should the souls of our own beloved dead no longer be in need of our suffrages, they will be bestowed upon others, who are deserving of our mercy as well; thus, our prayer, our labor of love, will not be less salutary and meritorious, and, indeed, life is not too long for us to practice this genuine charity to the end. 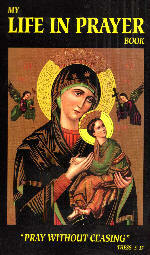 Special Intercession: Pray for the souls who suffer for inconstancy in the service of God. Practice: Examine how you have kept your good resolutions, particularly in the manner you have performed your devotions and works of charity for the suffering souls.